Eustache-Joseph BAZIN II(F-1823 / 1864). A. Born and died in Mirecourt. Cousin of François-Xavier. Not to be confused with Joseph-Eustache, father of François Xavier (1785/1863), who was not a maker of instruments nor bows. François-Xavier BAZIN (F-1824 / 1865). A. Brother of Charles-Nicolas Bazin I, and father of Charles-Nicolas Bazin II. Probably formed by Dominique Peccatte in Paris, then established himself in Mirecourt around 1840. A catalogue of Louis Bazin Son mentions him "Manufacture d'Archets de violons - Maison fondée en 1840". Charles-Nicolas BAZIN II, called Charles Bazin fils (F-1847 / 1915). Emile Joseph BAZIN (F-1868 / 1956). A. Born and died in Mirecourt. Son of Charles-Nicolas Bazin II. First a bowmaker, then a professor of music (1894). Gustave BAZIN (F-1871 / 1920). L. A. Son of Charles-Nicolas Bazin II. 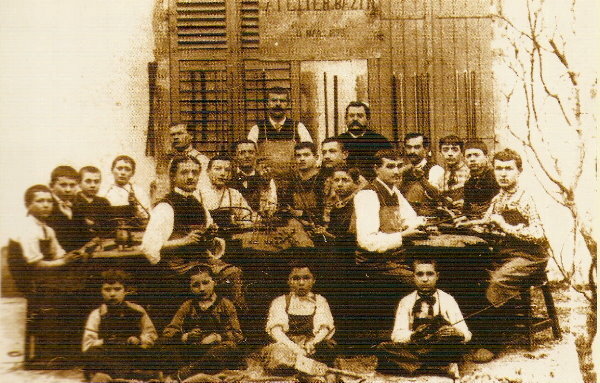 Starts off as a bowmaker (working for Collin-Mézin atParis from 1888 to 1891), then moved on to instruments making (Settling in Mirecourt, his home town). Gold Medal at the Rochelle (1898). Charles Louis BAZIN, called Louis Bazin fils (F-1881 / 1953). A. Son, pupil and successor (in 1907) of Charles-Nicolas Bazin II. Louis Bazin took over form his father Charles-Nicolas (to whom he had apprenticed at the age of 12) in 1915. Many bowmakers worked with him (Granier, Lorange, Tournier, Delprato, Lapierre, Ouchard, Jacquemin, Dumont, Couturieux, Richaume, Bourgeois, Bontemps, Husson…). Stamped his bows "Louis Bazin". Had 2 sons : René and Charles-Alfred. René BAZIN (F-1906 / 1982). L. A. Son and pupil of Charles-Louis (for bow making), pupil of Dieudonné (for instrument making). Worked with Marcel Vatelot in Paris, et with Fridolin Hamma in Stuttgart. A typical date for a BAZIN Louis (II) would be c.1950. 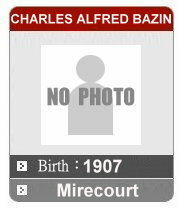 Charles Alfred BAZIN (F-1907 / 1987).